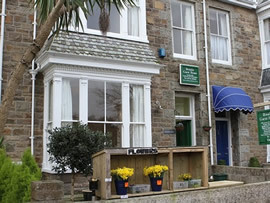 Your hosts at the Rosalie Guest House can provide a wealth of local knowledge to enable visitors to plan and enjoy their holiday to appreciate the beauty of Cornwall. They are located on a tree lined road leading from the promenade. Accommodation is a variety of twin, double and family rooms all furnished and decorated with care located on the first and second floors. Contemporary style bathrooms, wireless internet, hospitality trays, Tv/Dvd/Cd, central heating throughout and free on-street parking. 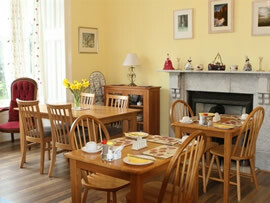 The bright cheerful Breakfast Room located on the ground floor incorporates a seating area in the Bay Window. Help yourself to a choice of cereals and fruit juice, fresh fruit and yoghurts, selection of beverages, and toasted bread. Traditional English breakfasts are cooked to order.